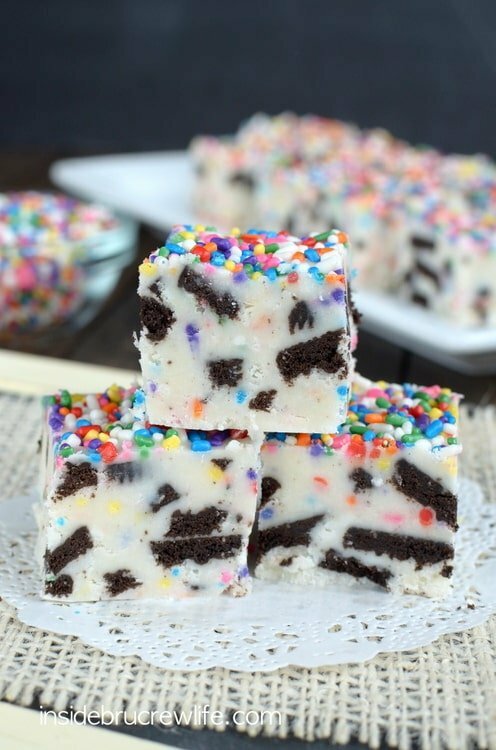 Sprinkles and Oreo cookie chunks make this Funfetti Cookies and Cream Fudge a blast to make and eat. 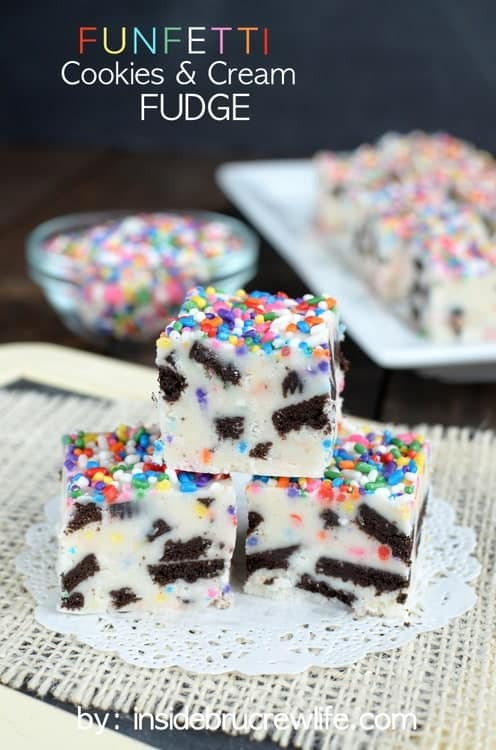 No one will be able to resist grabbing a few squares when you show up with this cute fudge. Hi, my name is Jocelyn, and I am a hoarder of baking supplies. At any given time I could make at least 10 different desserts using the baking supplies that are in my cupboards. Actually 10 might be kind of low…but I don’t think I really want to count what is in those cupboards and get an accurate number. 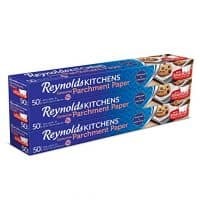 Just like a moth is drawn to a light or flame, I can’t resist the urge to walk down the baking and candy aisle every single time I go to the store. It doesn’t matter that I just bought 5 bags of candy the last time, another one or two will still make it into the cart along with some cookies, cake mixes, pudding, and sprinkles. My husband tells me I have a problem. Yeah…he is probably right. But I’m ok with that, and I think you guys are ok with my “problem” too. I mean look at this fudge staring back at you. Sprinkles and Oreos are a wonderful thing to hoard in your cupboards until inspiration hits. You should try it some time. The fudge and the hoarding that is. 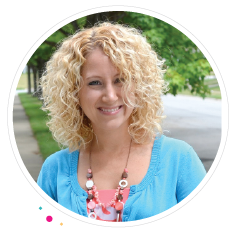 Although I suggest finding hiding spots that your kids do not know about. My kids have found out where I hide the baking Oreos. My oldest is crazy about Oreos, so he gets into the baking stash all the time. I think it is time for a new hiding spot. This fudge only takes about 10 minutes to make. If you are hoarder like me, you will have the 5 ingredients you need to make a batch today. This fudge starts with a bag of white chocolate chips that you melt over low heat with a 2 Tablespoons of butter. Then take the foil lid off a can of frosting and heat it in the microwave for 1 minute. The frosting will melt and become creamy. Pour this over the melted chips and stir it in quickly. You will need to work quickly because this fudge does set up very fast. If it does set up before you can get it in the pan, don’t worry. Put the mixture in a microwave safe bowl, and heat it for 30 seconds. The microwave is a life saver sometimes. Remember to have your chopped cookies and sprinkles ready BEFORE you start the fudge. Add those cookies and sprinkles to the hot mixture and stir gently. Do not over mix the fudge. The sprinkles will start to melt if you stir too much. Pour it into a foil lined pan and let it be for a few hours. Now cut into it and smile for joy at all the fun cookie chunks and sprinkles that are all over this fudge. See, it’s a good thing to hoard baking supplies when you can make yummy and cute things like this, right? 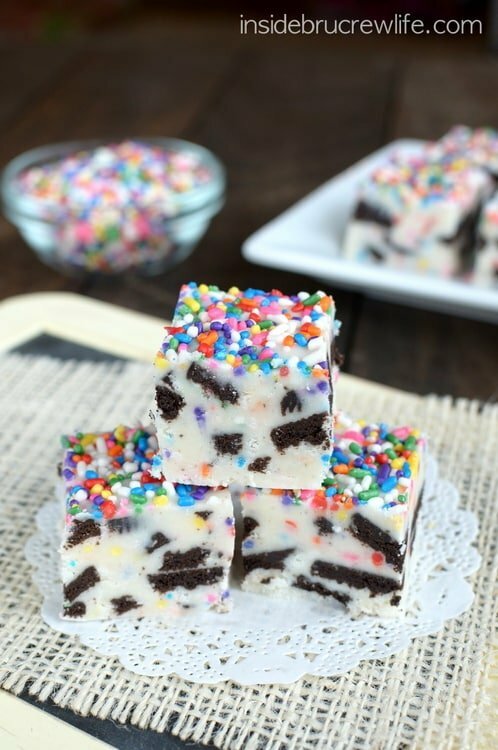 Sprinkles and Oreo cookies turn this easy 3 ingredient fudge into a delicious and smile inducing treat. 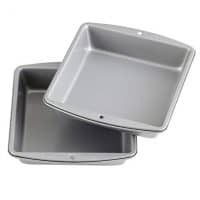 Line an 8x8 pan with foil or parchment paper. Heat the white chocolate chips and butter in a saucepan over low heat until melted and creamy. Keep it over the heat. Remove the foil lid from the canned frosting and microwave it for 1 minute. Stir and pour over the melted chips. Stir until the mixture is creamy. Add the cookie chunks and 1/4 cup sprinkles and stir gently. Do not over mix or the sprinkles will start to melt. Pour into pan. Add the rest of the sprinkles to the top of the fudge. Let set. Cut into 36 squares. Store in a sealed container on the counter. I love anything sweet! This fudge looks amazing, what a great and festive recipe again. It makes me happy just to look at the photos! Cookies and Cream is our favorite fudge variety (so far) and everyone knows that sprinkles make life better, so this fudge has to be great! I only recently made a few batches of fudge for the first time. I was amazed that something so good could be so easy to make! I haven’t tried making it with canned frosting. (I didn’t even know it was possible!) Pinned to try asap. Thanks, Jocelyn! Haha I’m the same when I go into a supermarket, I always chuck a few packs of candy bars in my basket then stash them away in the pantry when I get home. Sometimes I forget I have them only to realize there about to go out of date when I have a rummage to see what I’ve got. 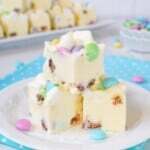 This fudge looks yummy! Love these and I love the white chocolate and butter method of making fudge too. It’s so easy and results in gorgeous fudge. Oreos and sprinkles make me happy. I bet this tastes amazing. Pinning. This is so very fun!! I love it for simmer parties! This looks so so pretty Jocelyn! What a fun and festive recipe! Hehe I can just imagine how your pantry looks with all the amazing treats you share with us all the time – love the oreos and sprinkles in here! I’m sold – sprinkles AND Oreos?! Love! Love this. 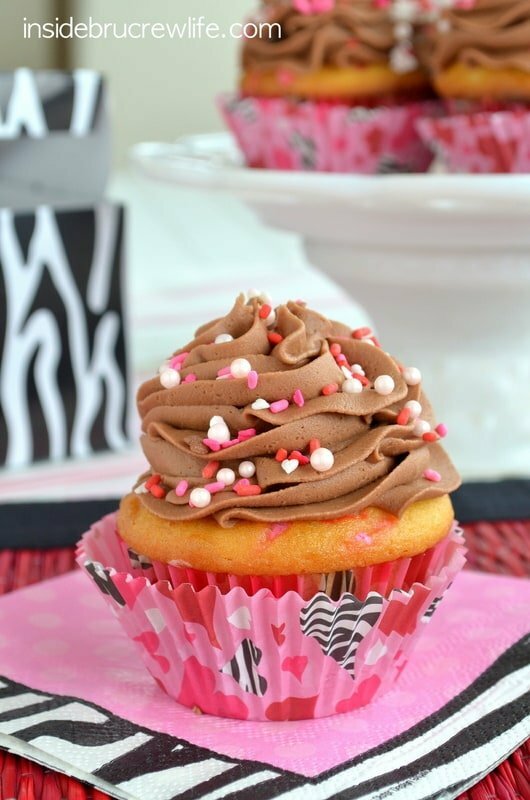 Using frosting is so great and also so effective! Yep, color me addicted to this fudge! 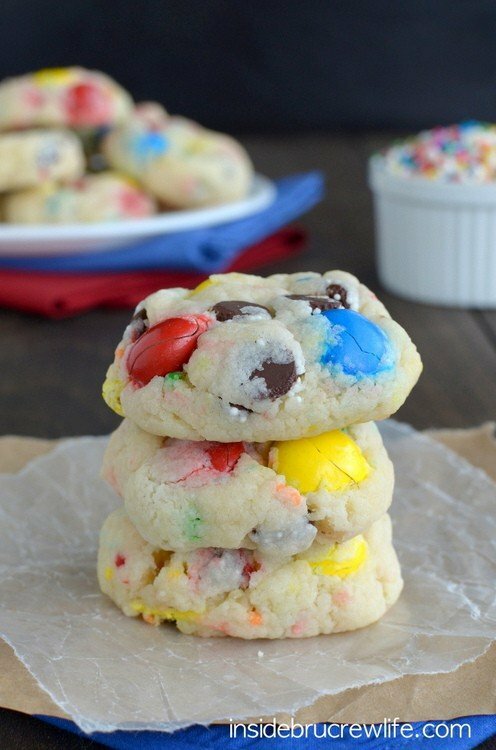 So many chunks of cookies and SPRINKLES! I want to be a hoarder of this fudge! OMG cookies and funetti together. This looks like the ultimate dessert in my book. I”m not a fan of cream cheese icing do you think a can of vanilla would be okay instead? 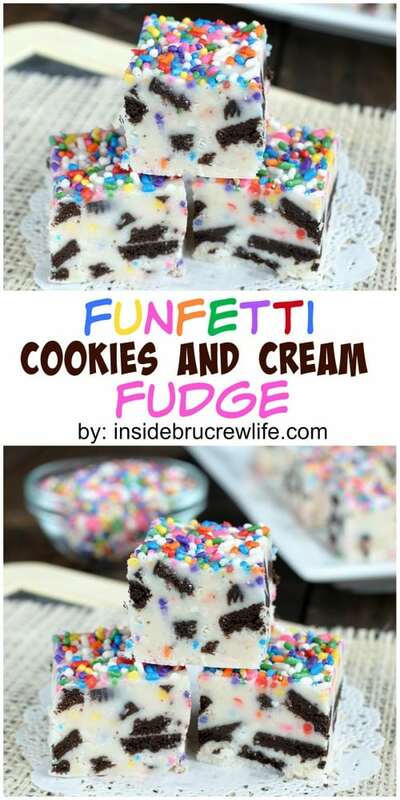 This fudge is soooo adorable, and I bet the cream cheese frosting add the perfect flavor! 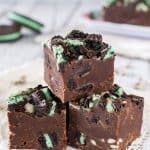 This fudge looks too easy to not try making ASAP! Great recipe! 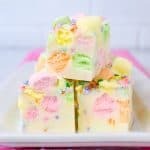 My kids would LOVE these confetti treats! What a fun flavor for fudge! Sprinkles are the best! Really, could you make these any more irresistible? Who could only eat one of these adorable, little devils of deliciousness? Would butter cream frosting work? These look like a party, but mly grandson does not like cream cheese. You can definitely substitute the vanilla canned frosting in place of the cream cheese frosting. 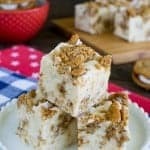 The key to this fudge is that it uses the store bought canned frosting! This is my favorite way to make fudge- foolproof and CRAY-ZY delicious 🙂 So cute, girl!! Oh this is a brilliant combination. 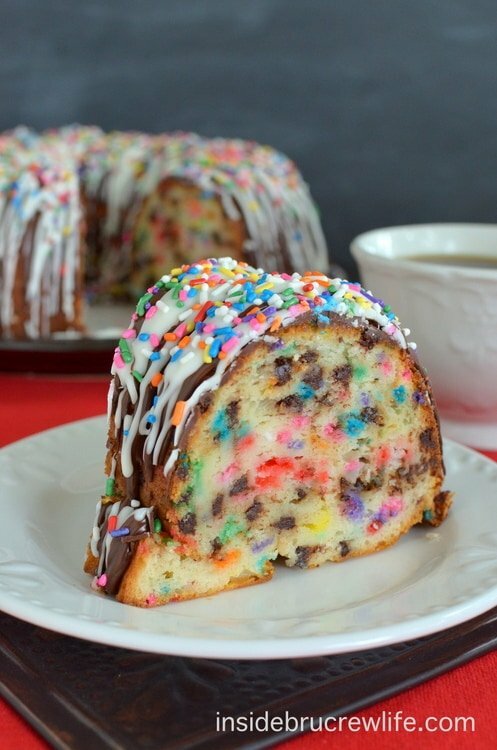 Funfetti and chocoalte together! I love it when I don’t have to make a choice. Me too!! 😉 Thanks Mallory! What a wonderful sweet treat – SO pretty and i can just imagine how delicious! This is soo delicious looking, not to mention pretty 🙂 Funfetti anything makes it ten times better. That fudge looks amazing! I will admit I am a hoarder as well but not with baking supplies…with spices. The problem is I find a great new recipe and I try to remember without looking whats in my cabinet and I end up with 3 bottles of the same spice. Its kind of a problem! Well this is just about the prettiest fudge I’ve ever laid eyes upon! AND ITS FULL OF OREOSSSSS!! Love. 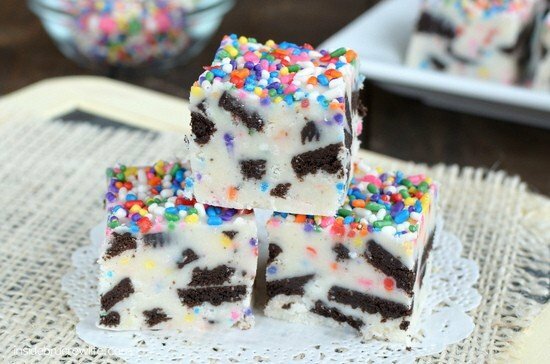 Fudge made with Oreos, sprinkles, and frosting?? 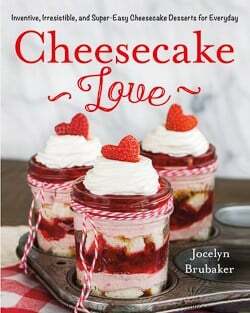 Jocelyn, you are a genius!! 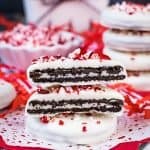 I definitely need a secret hiding place for Oreos too, although our kitchen doesn’t have a pantry, which would make that difficult… My guy hates chocolate but still loves Oreos (how does that work??? ), and with how addicted I am to them too, the packages always disappear much too fast — just like your fudge! 🙂 And I’m so sorry for being such a bad blog commenter lately! I’ve really missed you and your sweet treats!! Looks so good! 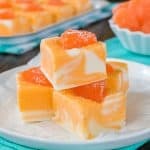 Does this fudge hold up well or melt easy? I’m wanting to ship it in a care package but it can get Armstrong shipping. Do you know how long it keeps for? Thanks! It should keep for a week or so if wrapped tightly. And it doesn’t melt at room temperature. I’m not sure where you are sending it though…obviously it’s made with white chocolate chips so if it gets too hot it could melt.